PITTSBURGH — Drivers headed north on Interstate 279 in Pittsburgh are known to take an unplanned stop not long after they curve past the Allegheny River. A mural on the outside of Verdetto’s Bar is to blame. Tributes of this sort are not necessarily unusual, but this one of Clemente especially speaks to the human need to hold onto certain things. The mural is the product of an artist born a decade after Clemente died, a bar owner barely old enough to remember seeing him play, and the elder Verdetto’s chance meeting with Clemente in a produce market 50 years ago. The two are Pittsburgh lifers, and while neither is particularly sentimental about their fandom — 1960 is a benchmark as much because Patricia was pregnant as the Pirates’ World Series win — there’s one keepsake they have held on to since the early 1960s: Clemente’s autograph on a piece of scratch pad paper with “Jackman’s Liquor” at the top. Branded scratch pads were common at the time. Making a trip to a produce store in Pittsburgh’s Strip District over half a century ago, they lucked into seeing Clemente and his wife. “When I asked him for an autograph, he didn’t hesitate,” Len Sr. said. It was a simple signature on a piece of 1960s scratch paper thanks to a chance meeting in a mundane setting. They’ve kept the autograph in a family safe ever since. Decades later, their son was approached by a local muralist looking to use the outer wall of the bar as a canvas. 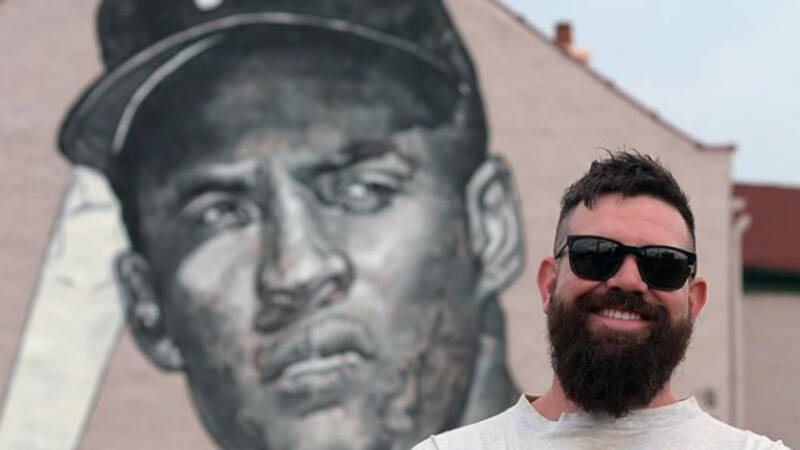 Jeremy Raymer, who had already made a name for himself in Pittsburgh with his outdoor murals, was looking for the right spot for a larger-than-life painting of Clemente. He originally had his eye on a warehouse in another part of town, but a friend alerted him to Verdetto’s place. “I had driven past and realized how good of a spot it was for a mural there,” Raymer said. The bar sits next to an empty, grass-covered lot that lets the Clemente image look toward Pittsburgh’s downtown. Raymer said that while he was working on the mural, a friend who works in a highrise in the center of the city could see him painting from his office. A former senior test engineer for Westinghouse, Raymer first started painting small oil portraits in his free time in 2005. After seeing the street art of Wynwood Walls on a trip to Miami, Raymer said, he was inspired to try expanding his work to the walls of Pittsburgh. Raymer hadn’t studied art beyond a handful of classes in college, but after lots of trial and error and YouTube tutorials, he was getting enough commissions to leave his job in May 2016. Two years later, he went into Verdetto’s bar to pitch Len Jr. on painting Clemente on the wall. It didn’t take much convincing. Len Jr. doesn’t remember Clemente as a player all that well, but he remembers collecting coupons from a local factory in the late 1960s and early 1970s to get tickets to Pirates games. He was 7 when the Pirates won the 1971 World Series. The celebration, he said, was like a world war had just ended. Clemente died in a plane crash at the end of 1972, and though Pittsburgh has had no shortage of sports heroes since, he has continued to hold the collective heart of western Pennsylvania. Raymer said he chose the image of Clemente because he felt like the distant gaze on his face was fitting. Given the mural’s size, it’s like Clemente is looking out over the whole of the city, almost with melancholy. “He’s a god here,” Raymer said. Len Jr.’s parents have a deck that comes out of their apartment on top of the bar, and from there Patricia often sits and watches as people stop to look at the mural. She loves every bit of it. Her husband laughs fondly at the young people who stop to take selfies with it even if, like Raymer, they’re too young to have seen Clemente play. Len Sr. and Patricia recognize the hold he still has on their city; they see it every day. “A lot of times, everybody went just to see him,” Len Sr. said of the days when Clemente was the main draw for Pirates games.